There are currently over 80 different types of sleep disorders listed in the International Classification of Sleep Disorders (or ICSD), the latest edition of which was published in 2005. This is fantastic evidence of how far we've come in the field of sleep medicine in the last handful of decades; however, the fact that an enormous number of people who actually have these various types of sleep disorders are not diagnosed and live without treatment goes to show how very far we still have left to go. Sleep medicine hasn't yet permeated the medical school curriculum to any significant degree, so there's a large discrepancy between the knowledge that exists about sleep medicine and what most general physicians know about it. As a result, many types of sleep disorders go undiagnosed, mistaken for other ailments whose symptoms may be caused by the sleep disorder. This highlights the important role that sleep specialists play in society's overall health, but also the extraordinary importance of widespread public knowledge about the types of sleep disorders and their symptoms. If you know how certain sleep disorders make themselves apparent and affect waking life, you will be well-equipped to catch them in yourself and your loved ones. The fact that most doctors know very little about sleep disorders today poses a serious threat to many individuals who already have, or will soon develop, a sleep disorder. Everyone is almost certain to experience one or more sleep disorders in their lifetime. If the current situation does not change, the majority of our citizens who are suffering from sleep disorders will remain undiagnosed and untreated. 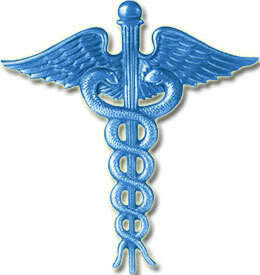 Everyone knows that pain and fever are likely to be associated with a medical problem. It is crucial that everyone also know and recognize the symptoms that are caused by specific and often very serious sleep disorders so that appropriate actions can be taken. What is Dr. D's sleep book? The knowledge we have about sleep disorders has only trickled into benefits. We can open up the floodgates by creating more awareness. What Dr. Dement highlights above really goes to show that the general public, you and me, would be doing themselves a great favor if they didn't have to be dependent solely on doctors when it comes to sleep health. Sleep medicine is still working its way into the field. So in the meantime, if we educate ourselves we can avoid the debilitating and sometimes fatal consequences of sleep disorders, being ready to consult a sleep specialist when the need arises. Dyssomnias are disorders that produce either excessive sleepiness or difficulty in initiating or maintaing sleep. Some of the most common dyssomnias include obstructive sleep apnea, restless legs syndrome, and conditions of the biological clock such as shift work sleep disorder, and delayed sleep phase syndrome. Dyssomnias can additionally be divided up into three sub-categories: Intrinsic Sleep Disorders, Extrinsic Sleep Disorders, and Circadian Rhythm Sleep Disorders. Let's look below to see how the various types of sleep disorders fit in. Idiopathic Insomnia - Basically a lifelong inability to obtain adequate sleep, presumably due to an abnormality of the neurological control of the sleep-wake system. 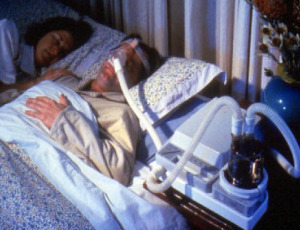 One of the most common and dangerous dyssomnias, obstructive sleep apnea, is treated using this continuous positive airway pressure (or CPAP) machine. Recurrent Hypersomnia - This rare condition is characterized by repeated episodes of too much sleep, typically weeks or months apart. The best known form is Kleine-Levin syndrome (more colloquially known as the Sleeping Beauty syndrome). Limit-Setting Sleep Disorder - Primarily a childhood issue, limit-setting sleep disorder is characterized by the inadequate enforcement of bedtimes by a caretaker with the patient then stalling or refusing to go to bed at a time conducive to good health. Circadian rhythm sleep disorders make it hard to fall asleep when you want to. Note: Much of the medical descriptions contained on this page come from The Stanford Sleep Book. Before we move on to parasomnias, do you want to dig a little deeper into the different types of sleep disorders from a visual perspective? Getting enough sleep is vital for mental and physical health, but sleep disorders often prevent this health from being achieved. This video, hosted by Jane Hanson and featuring Dr. James Wyatt among others, delves into how this disruption occurs and what that means for you and society at large. It also gives an overview of some of the most common sleep disorders. Unlike dyssomnias, parasomnias are clinical disorders that are not abnormalities of the processes that govern our sleep/wake states (processes such as our biological clock, for example). Instead, parasomnias consist mainly of inappropriate physical behaviors that intrude predominantly during sleep. Sleepwalking is a common parasomnia. When you think of parasomnias, "physical" is a key word. Think of examples such as sleepwalking, sleep starts, bruxism, and bedwetting (or sleep enuresis, as it's technically called), which all involve some sort of specific action or movement. This is not an overarching rule, but just something to help you remember the majority of parasomnias by (note too that parasomnia and physical both start with the letter p). Other disturbances that encroach into sleep, such as nightmares, also fall under the category of parasomnias. Really severe arousal disorders have even been known to bring about violence during sleep, sometimes resulting in deaths and court hearings. You can learn more about sleep-related violence and the trials that follow here. REM Sleep-Related Sinus Arrest - A cardiac rhythm disorder that is characterized by sinus arrest (a pause in the cardiac rhythms) during REM sleep in otherwise healthy individuals. EKG monitoring demonstrates periods of asystole (a lack of contractions of the heart) during sleep that may last up to nine seconds! These periods of asystole occur repeatedly during REM sleep and as you can imagine, are very alarming and dangerous. They also are not associated with either sleep apnea nor sleep disruption. Sleep-Related Abnormal Swallowing Syndrome - A disorder in which inadequate swallowing of saliva results in aspiration (inhalation) of excess saliva, with coughing, choking, and brief arousals or full awakenings from sleep. Sudden Unexplained Nocturnal Death Syndrome (SUND) - SUND is characterized by sudden death during sleep in healthy young adults, particularly of Southeast Asian descent. Neither clinical history nor autopsy results provide an explanation for the cause of death--it remains a mystery. According to witnesses of SUND though, the first signs are choking, gasping, and labored respiration. Sudden Infant Death Syndrome (SIDS) - SIDS is unexpected sudden death of infants in which a thorough postmortem investigation fails to demonstrate an adequate cause for death. At least 80% of SIDS deaths occur at a time when infants were assumed to be asleep. It has not been unequivocally established whether the primary cause of death is cardiac or respiratory failure. You can learn more about parasomnias here, with a wonderful article written by Jacqueline To. Most mental or mood disorders can have some sort of sleep disturbance that typically comes along with it to affect the patient. The ICSD includes various psychoses, mood disorders, anxiety disorders, panic disorders, and alcoholism in its list of sleep disorders because they are commonly seen in patients who present sleep complaints, and thus need to be considered to paint the full diagnosis picture. This category of sleep disorders associated with other medical disorders is also broken up into three sub-categories: Mental Disorders, Neurological Disorders, and other Medical Disorders. The disorders that fall within each category are listed below. Parkinsonism - Refers to a group of neurologic disorders characterized by hypokinesia, tremor, and muscular rigidity. Insomnia is the most common sleep-related symptom in patients with parkinsonism. 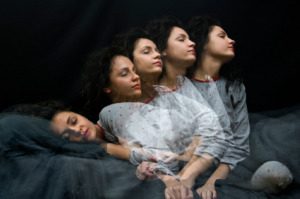 Fatal Familial Insomnia - A progressive disorder that begins with difficulty in initiating sleep and leads to total lack of sleep within a few months and, later, to spontaneous lapses from quiet wakefulness into a comatose state with enacted dreams. Sleep-Related Headaches - Sleep-related cluster headaches, chronic paroxysmal hemicrania, and migraines are severe, mainly unilateral headaches that often have their onset during sleep. The patient is either awakened with pain during the night or is aware of an attack upon awakening in the morning. Chronic Obstructive Pulmonary Disease (COPD) - Characterized by a chronic impairment of airflow through the respiratory tract between the atmosphere and the gas-exchange portion of the lung. Altered cardiorespiratory physiology during sleep or a complaint of insomnia can occur. Fibromyalgia - Characterized by diffuse musculoskeletal pain, chronic fatigue, unrefreshing sleep, and increased tenderness in specific localized anatomic regions, without laboraty evidence of contributing articular (joint), nonarticular, or metabolic disease. What Do Sleep Disorders Do? Do you want to dig a little deeper into the different types of sleep disorders from a visual perspective? This video, from Dr. Gerald Chodak, does a nice job of illustrating the complexities inherent with such a large variety of ailments, and how sleep disorders can affect you. He highlights some neurological and hormonal factors at play with our circadian rhythm, physical characteristics that can lead to disorders such as sleep apnea, and you'll even get a taste of polysomnography from views in a sleep lab. Go from The Types of Sleep Disorders to What Is Narcolepsy?